I love Pete Evans. Seriously, I have a foodie crush on him. 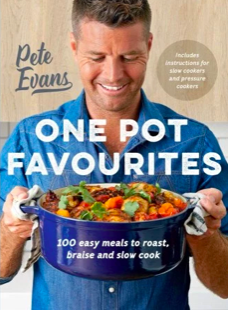 Last year it was all things Paleo, this year he makes my life easier with 100 easy meals in a pot. Well, not one pot with a hundred meals (though that would be nice too but this isn’t Hogwarts) but nevertheless, as the title says: One Pot Favourites: 100 easy meals to roast, braise and slow cook. They’re also paleo-inspired so for any of you suffering from allergies (like me) these recipes may offer some delicious relief. There are also options to use your slow cooker or, if you’re rushing around, your pressure cooker. Just make sure you read the handy instructions at the beginning because using it isn’t that scary and guarantees tender and moist meals, under pressure! One of the bonuses of this comprehensive culinary tome is that there is a whole section devoted to vegetables! There are of course favourites such as French onion soup and braised veggies but it’s also nice to see Borscht (a popular East European soup) make an appearance. With a dash of macadamia cream and dill, this vegetarian soup is colourful thanks to the beetroot and is always guaranteed to impress. The Aussie chef also has included a range of classics from Asia but without compromising on each dish’s unique qualities. Don’t expect the Malaysian fish curry to taste like the Bengali fish and start investing in coriander seeds, mustard seeds, and some tamarind wouldn’t go amiss either – because thankfully Evans makes his own marinades and curry pastes. One of the have-to-try recipes in this book is the seafood curry with, wait for it, avocado! Yes, it’s surprisingly fresh and revelatory. In fact, if you haven’t had fruit regularly with your soups you’ve been missing out. The paleo Matzo balls are also compulsory and replacing the grains with ground almonds makes it super healthy and quite light. There’s also Peruvian Roast Chicken, hallelujah Latin American cuisine is getting past the ethnic aisle, and would you believe so is Ethiopian! Your Sunday roast has never tasted this fragrant, aromatic and delicious – and please don’t use the word ‘exotic’ with your guests, it really is so colonial. Personally, I was delighted with Evans’ version of Coq au Vin (chicken and wine are worthy of any and all matrimonial blessings) and the Gumbo will be an instant family favourite. Cajun spices and flavours aren’t as popular as they should be but if you haven’t made creole food before this is definitely a good start. There’s also lamb, pork, beef and venison options (the lamb liver is almost fool proof, just watch for tenderness) and the Indonesian beef ball soup is surprisingly refreshing. At the end of the book you’ll also find some essential recipes for making your very own vegetable starter culture, yellow curry paste, paleo hoisin sauce, kimchi, chili oil as well as broccoli rice and cashew sour cream – to name just a few. You might also develop a handy drawer full of your own activated nuts and a jar or two of fermented veggies. This is definitely one of my favourite cookbooks and my family certainly aren’t complaining!